Foley, son of former Ireland lock Brendan, made a try-scoring debut for Ireland against England during the 1995 Five Nations. He was a regular in the Ireland 'A' setup after, also plying his trade for Shannon and Munster. In 2000 he secured a run in the side, playing all of their Six Nations Tests and touring America as Ireland's No.8. His international career eventually garnered 62 caps before his final Test against Wales in 2005, but it was his captaincy of Munster that drew the greatest plaudits. Foley retired in 2008 as Munster's leading caps holder and completed his quest to lead the side to the Heineken Cup in 2006. Foley had earlier fallen at the final hurdle twice, against Northampton in 2000 and Leicester in 2002, but Peter Stringer's cheeky try ended a long wait for player and province as Biarritz were beaten in Cardiff. He later took up a coaching role with the province, serving as a defensive specialist, and also worked with the Ireland Wolfhounds in 2011. 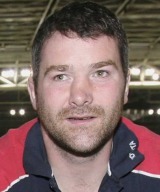 Later that year he was named as successor to Australian Laurie Fisher in the Munster forwards job.